Months of exposure to the winter elements, road salt, and other abrasive particles have probably stolen the luster from your car’s finish. And looking ahead to summer’s heat, UV radiation, bugs, tree sap, and pollutants, there’s no better time than now to prepare your car’s finish for the days ahead. The key to giving your vehicle the best detail job is choosing the right car care products and materials, and knowing how to use them. The process begins with a thorough wash and wax of the exterior and ends with a careful cleaning of the interior. To keep your finish in top condition, car cleaners are available in varying degrees of abrasiveness depending on your need. Always start with a light abrasive cleaner, then go to a stronger abrasive if needed to restore the topcoat. If you would like a step-by-step process or more information, visit our How to Wash and Wax your Car page. It’s easy to forget about the state of our tires and wheels. But if you want to make your car shine like new, it’s best to invest in a tire and wheel cleaner, as seen in the above video. Brake dust and grime can be easily removed from the tires and wheels with the wide variety of wheel and tire cleaners available at Pep Boys. To give them a 'satin shine' just wipe down with a microfiber towel or terry cloth after you have applied the product. Waxing your car is perhaps the most important and final step in improving your car’s exterior appearance and protecting the paint. There are several varieties of wax, from all natural to synthetic formulas, which employ silicone resins for easy application and durability. When waxing your car, wax only one small section of your car at a time. Working in one direction, wipe off the wax. Then, using a polishing cloth, buff in the opposite direction for a high shine. Be mindful to never wax a car in direct sunlight or while it is still hot from running. The wax will be hard to remove and will leave an inconsistent, streaky finish. If you want to do the DIY detailing job done right, don’t forget about the interior. After you clean and organize your car’s interior, vacuum and shampoo the cloth or vinyl seats and carpet. Dust and dress the dashboard, console, and interior door panels. 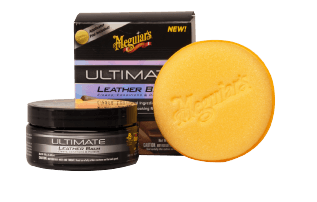 For leather, it is recommended you use a cleaner and preservative. To learn more about maintaining your leather seats, visit our How to Maintain Leather Seats article. 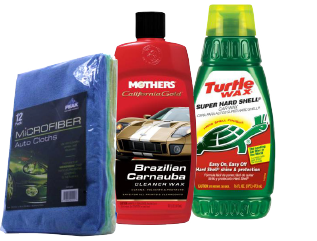 A fresh cleaning with top-name care products can breathe new life into your car and maintain those good looks year-round. Visit your local Pep Boys to find the cleaning products you need to keep your vehicle shining bright.